Theophilus “Theo” Lacy, was a farmer, stable operator, and former Santa Ana town treasurer. 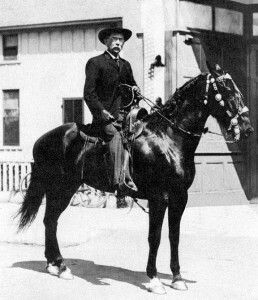 He was also Orange County’s second (1891-95) and fourth (1899-1911) sheriff. Because the county was principally agricultural and sparsely populated, however, Lacy didn’t have much to do other than chase vagrants, look into an (infrequent) fight or robbery, and oversee the simple jail. Theo Lacy died in June 1918, as one of the county’s best-known citizens. Today, one of Orange County’s modern jails is named after the Lacy family. The subterranean Brunner’s Basement, clearly a stopgap measure, was in use only from August 1889 to May 1890 (although there are vague records of an unnamed “basement” lockup used for intoxicated persons, back in the late 1870s, before the county existed. This may have been a Santa Ana city jail). With the first county jail came the first jailbreak, in November 1889 when four of the eight prisoners manually threw a lock bolt and strolled out. Sheriff Richard T. Harris thought it over, surmised that the escapees “were well on their way to San Diego” by now, and good riddance. Saved the county 40 cents a day to feed them, anyway. In any event, that 1889 “walk-away” jailbreak meant it was time for Orange County to have a real jail, so $4,000 was allocated for a new facility on Sycamore Street between Second and Third Streets, which opened in May 1890. Sometimes called the “First Sycamore Street Jail,” this was a small brick building containing three iron cells. It had its own rock pile next door, where the prisoners “made little ones out of big ones.” There was said to be no fence, just a ball-and-chain for each guest. Although there is no record of a break-out from this jail, there was, unfortunately, one break-in, and it is still to the county’s great regret. Sheriff Theo Lacy had only two deputies in 1892, one who stayed in the office and one who oversaw the jail. (There was no such thing as routine patrol; officers went out only when summoned.) Among the prisoners was ranch worker Francisco Torres, who had used an ax to kill a well-liked local ranch foreman, and then fled to Escondido, where he was arrested. Sheriff Lacy retrieved Torres by train, but the sheriff had heard murmurings of a lynching. Accordingly, he ordered the train to stop early as it entered Santa Ana, and he whisked the prisoner to the jail. Still concerned at the growing restive sentiment, Lacy asked the County Supervisors for funds to transfer Torres to the Los Angeles jail for safekeeping. The supervisors responded by authorizing an additional guard instead. On August 20, 1892, a quiet, orderly mob broke open an iron jail door, shoved Deputy Robert Cogburn aside, removed Torres, and strung him up from a telegraph pole at Fourth and Sycamore streets. Along about now (date uncertain), two inmates using a jackknife and a bucket dug their way out of the jail and slipped away, taking the jail blankets with them. The fleeing blanket-thieves split up but were captured. At some point, two other men burglarized a blacksmith’s shop, and stole tools that were then used to break into the jail and free about five vagrants. They were all captured, but then one of them took off again. Next, a group of prisoners removed metal bars from a furnace, and then, with a knife and two forks, dug themselves out. Such unseemly events were beginning to wear thin with the public, and in 1893 the Supervisors were forced to begin considering a new jail. 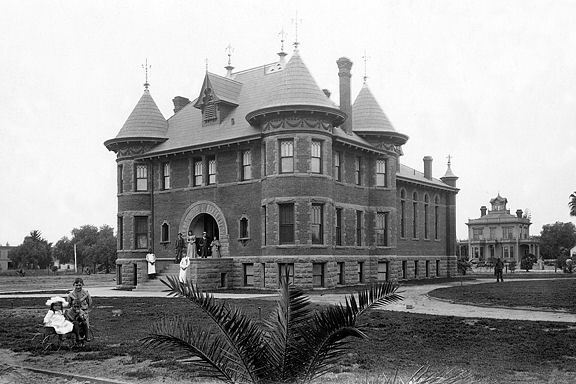 By 1897, the (slowly) growing Orange County required its third jail upgrade in eight years. A land parcel in the 200 block of Santa Ana Boulevard was purchased for $8,000, and $23,000 was allocated for a three-story lockup to be named Spurgeon Square Jail. It was better known as “Lacy’s Hotel,” named after Sheriff Lacy, whose family resided in, and oversaw, the lockup. The fortress-like Lacy’s Hotel, the first building in Spurgeon Square and soon to be joined next door by the grand old red sandstone courthouse, which elegantly survives today, was the county’s jailhouse for 27 years. The fourth Orange County Jail and Sheriff’s Office, “Old Sycamore,” was constructed at 615 North Sycamore Street in Santa Ana in 1924 and remained in use for 44 years. (Orange County gets high mileage out of its jails.) It had an initial capacity of 260 inmates, but soon surpassed that number, as Orange County jails have tendency to do (and which for decades has drawn Grand Jury attention). In the early 1930s, crowding necessitated adding a fourth floor (“The Penthouse”) to Old Sycamore. For the third consecutive year, Orange County Bail Bonds located in Santa Ana, California has been selected for the 2011 Best of Orange County Award in the Bail Bonds category by the U.S. Commerce Association (USCA). Nationwide, only 1 in 120 (less than 1%) 2011 Award recipients qualified as Three-Time Award Winners. Various sources of information were gathered and analyzed to choose the winners in each category. The 2011 USCA Award Program focuses on quality, not quantity. Winners are determined based on the information gathered both internally by the USCA and data provided by third parties. The USCA was established to recognize the best of local businesses in Orange County. USCA works exclusively with local business owners, trade groups, professional associations, chambers of commerce and other business advertising and marketing groups. Our mission is to be an advocate for small and medium size businesses and business entrepreneurs across America. Orange County Bail Bonds is excited and proud to announce the 45th anniversary of our family helping families in Orange County and through out California with their bail bond needs. Starting in 1963, Orange County Bail Bonds has provided fast and discreet bail service for Santa Ana bail bonds. We also service your bail needs through out Orange County, Los Angeles County, Riverside and San Diego Nationwide service is available, as well. Call us when you need a bail bond in Costa Mesa, Santa Ana or anywhere in the country; we can often offer financing and collateral is not always required.